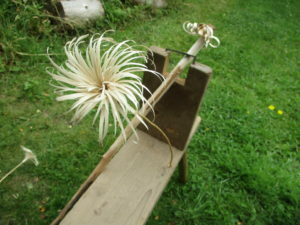 This is a rudimentary jig that I made to ease the process of making Gypsy Flowers with a knife or shave horse / drawknife. 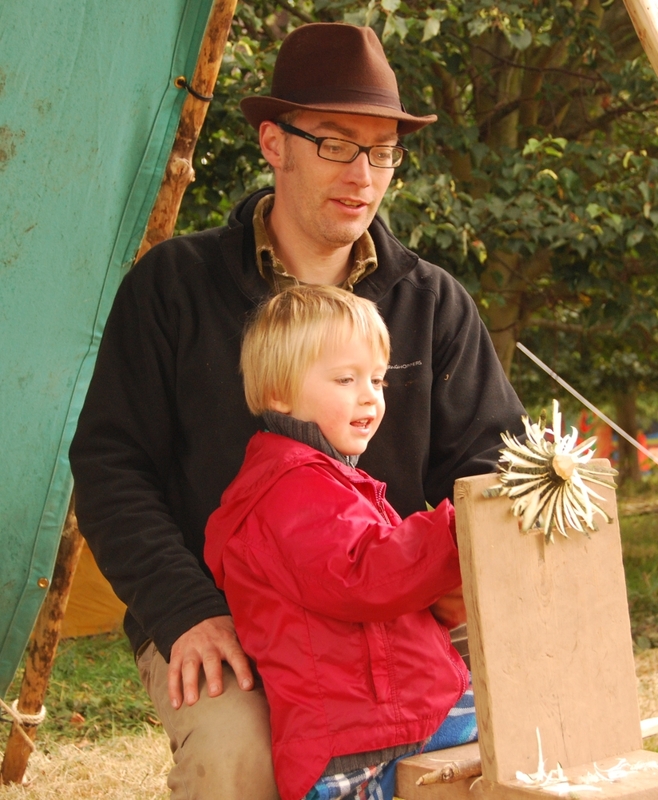 It turned out to be great for demonstrating at festivals, shows and forest school sessions because people can have a go without needing much instruction or the establishment of prior trust. 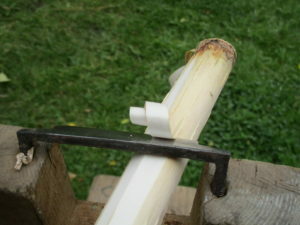 The action of pulling a stick past a static blade gives a fine feel for the angle of cut and the amount of force required to slice through the fibres of the wood. 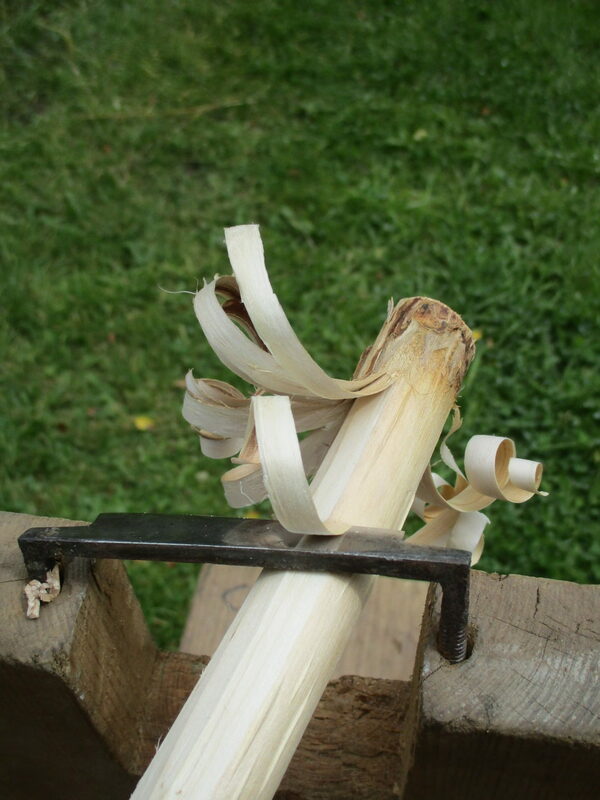 It is pretty much a one trick pony (sorry) as it only does one job but I have seen full time greenwood workers adapt their shave horse with a mounting hole and a forked stick holding the blade. This was just my quick and ugly solution to a problem and could definitely be made more aesthetically rustic – but it does the job. What follows isn’t a comprehensive tutorial. 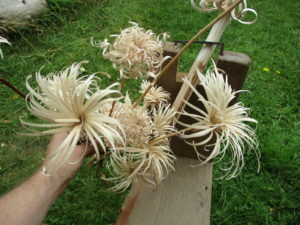 If you want to make gypsy flowers and you own the tools to make this then you can definitely figure it out from the photos and probably even improve on the design. 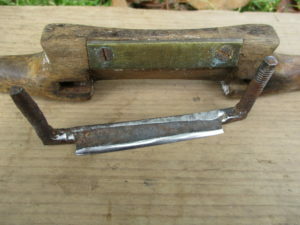 The first thing you need is a spare spokeshave that you can liberate the blade from. This was £2 at the car boot sale. This is the time to sharpen it – best to hold it in a vice or workmate if you would like to keep your fingers. A bench length to sit on with 4 splayed leg holes and a rectangular mortice to hold the upright plank. 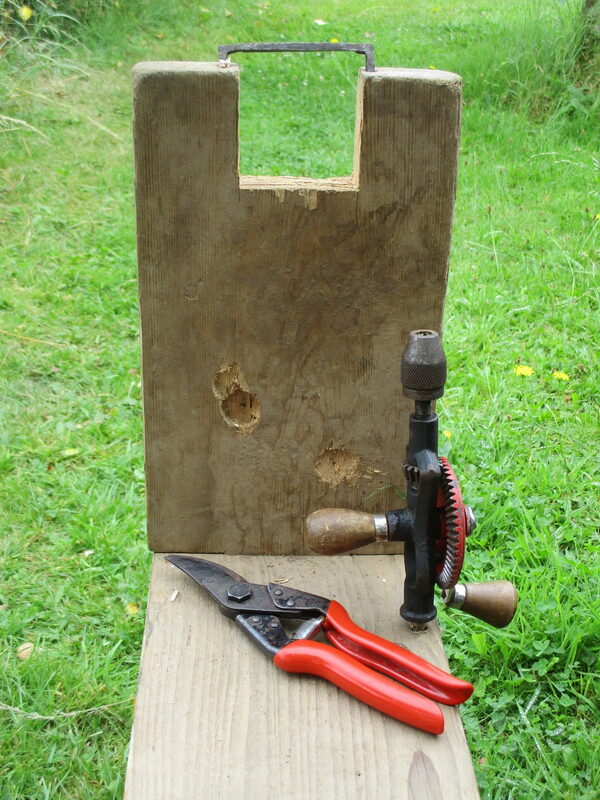 All holes are a little over sized so it comes apart easily to go in the boot or the shed. 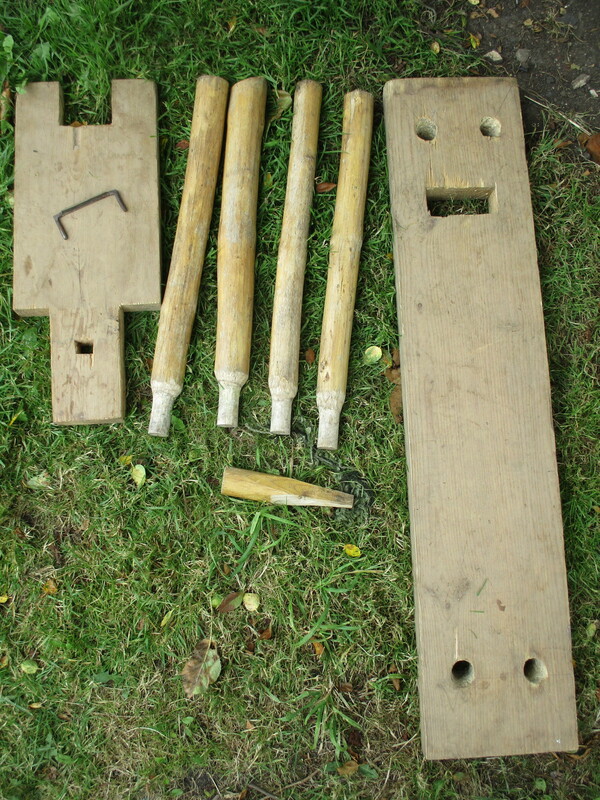 Upright with a section cut out at the top. I’d leave this bit over-long so you can work out a comfortable working height once you sit down on it. Chisel out a wedge shaped mortice in the upright directly below the seat plank. Loose wedge shaped tenon to fit the mortice and hold the whole thing together. 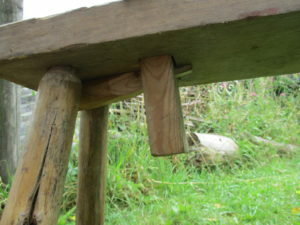 4 legs (these are all from one spare yurt roof rib) tenoned to fit the seat holes. Close up of the mortice and tenon wedge the holds the upright in place. It knocks in really tight with a mallet and releases with another sharp tap to fit back in the car. This is the spectators view of the pony. The flower maker sits behind the blade in this photo with the sharp edge of the blade facing away from them. The blade fits into 2 tight holes drilled at an angle toward the seat. You may need to mess about with this to find the best angle for you. I wedge the blade with shavings or matchsticks to stop it wobbling about . 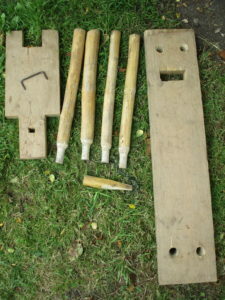 The wood you are working on goes under the blade and you pull towards you. For some reason I always work anti-clockwise. Try out seasoned and unseasoned wood of different species to see what happens. I like using willow or hazel that was cut a few weeks ago. Sometimes I speed dry willow by peeling it and leaving it in the car for a day. All that is needed for full production mode. 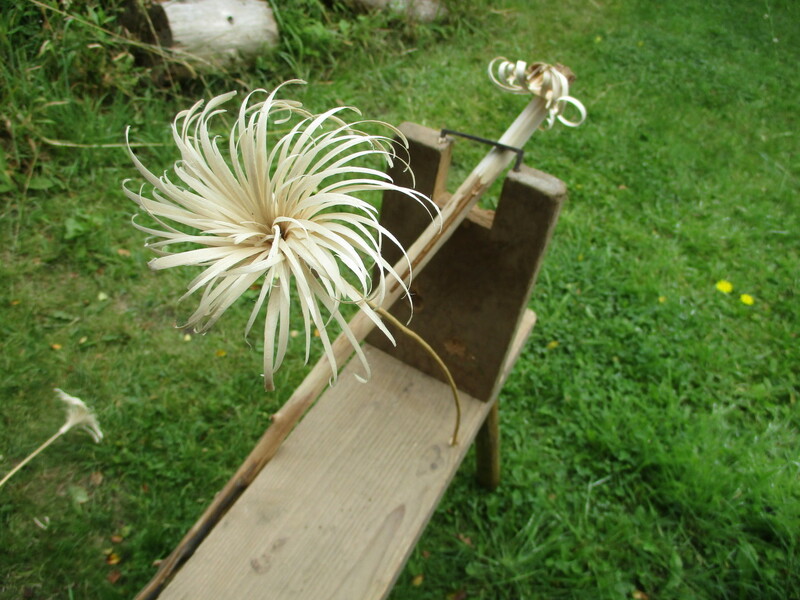 I took the handle off a twist drill and put it in a hole (new 4 or 5 mm bit needed) Secateurs are for snipping the dragons teeth created by each flower on a stick. ‘Dragon teeth’ are a great giveaway for children watching at an event. The product of about one hour of very enjoyable work. I will have the pony set up on my stand at the North Devon Show on Wednesday 3rd of August so if you are in the area and fancy trying your hand then come along and say hello. Thanks Richard, exactly what I needed to know! 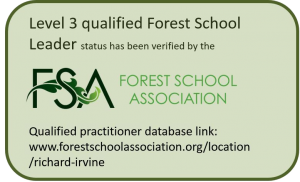 Looking forward to seeing the results of your labours on a Forest School group somewhere. Brilliant! Thank you Richard. Great project for my Monday group to get their teeth into and good use of the spare spokeshave I’ve got knocking about. 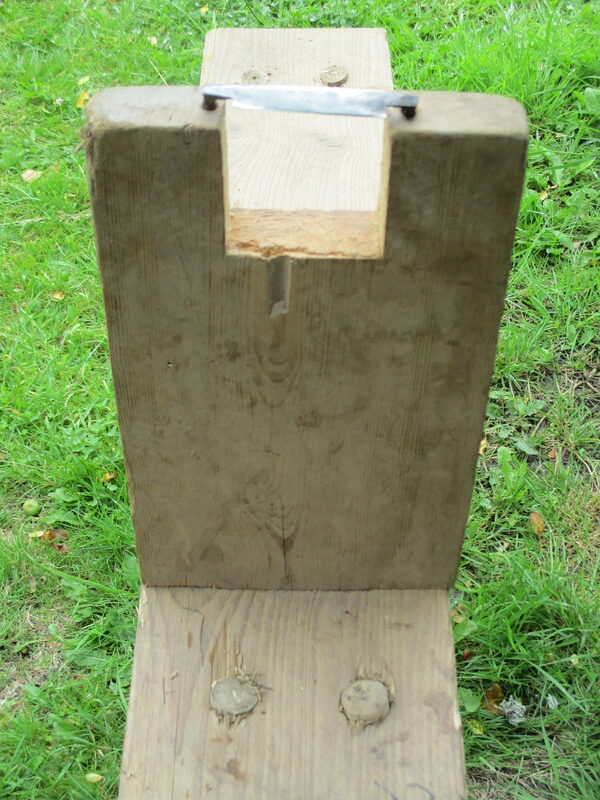 Also another nice little project for our very popular new mortice and tenon cutter – great investment of some of our project funding. 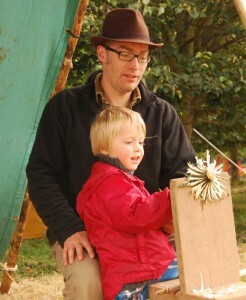 We would never have embarked on some of the projects we’ve done this year without it. Glad it was helpful Kathy. Looking forward to seeing the results. Since I’d put the pony together this afternoon, I had to go and have a little play for a while when I should have been doing other things. Awesome sauce. 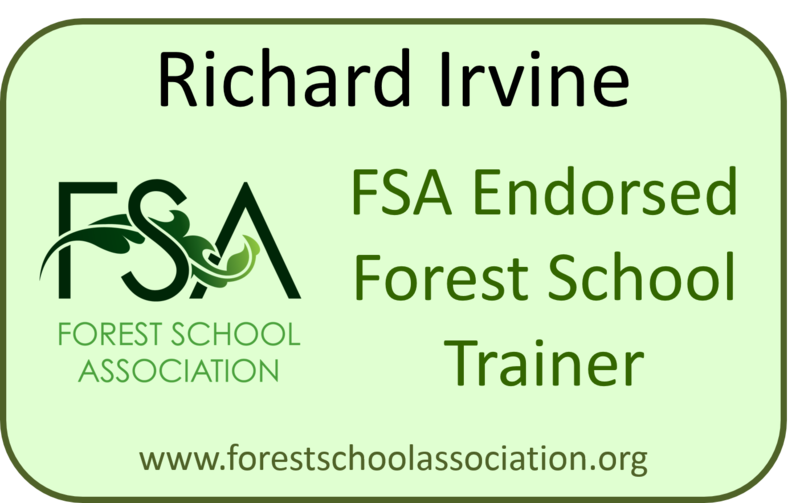 Much appreciated richard.